New footage from Portugal Air Force shows Air Astana flight emergency landing at Beja air base. On Sunday,Air Astana #KC1388 declared an emergency general emergency after reporting flight control problems to Air Traffic Control. According to ATC, during the first 30 minutes of the pilots attempted to reach the sea for a ditching. 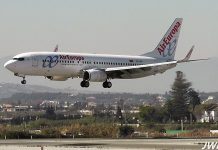 At 15.26 UTC the aircraft landed at the airport of Beja air base, about 180 kilometres (90 miles) southeast of Lisbon. The footage shows the Embraer landed on the right side of the runway.